The left-wing group that helped organize the violent shut down of the Milo Yiannopoulos event at the University of California, Berkeley on Wednesday is backed by a progressive charity that is in turn funded by George Soros, a major labor union and several large companies. The Alliance for Global Justice, based in Tucson, is listed as an organizer and fiscal sponsor for Refuse Fascism, a communist group that encouraged left-wingers to shut down the Yiannopoulos event. The call to arms succeeded. Yiannopoulos’ talk was cancelled after demonstrators lit fires, vandalized businesses, and assaulted Donald Trump and Yiannopoulos supporters. And on its Facebook page, the group asserted that the vandalism and arson were not “violence.” Instead, the group argued that Yiannopoulos and Trump perpetrate violence through the policies they support. “Dismantling police fences is not violent. And to compare preventing someone like that from speaking to the real-world violence that they perpetuate everyday is ludicrous,” reads one post on the group’s Facebook page. 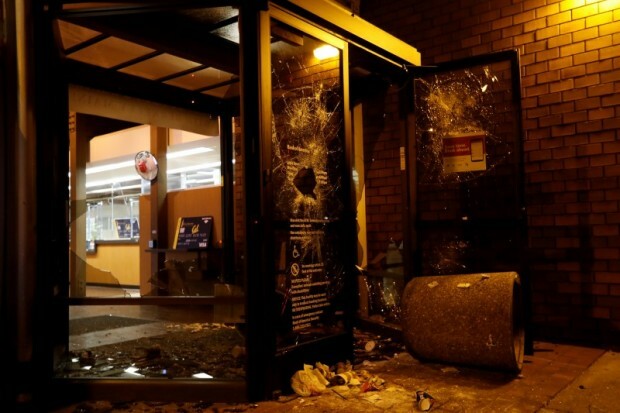 The organization did not mention the violent attacks against conservatives. One Trump backer was attacked with shovels by a group of men clad in black. He was shown laying unconscious in the middle of the street. A female Trump supporter was blasted with pepper spray while giving an on-camera interview. Refuse Fascism’s involvement has spurred questions about who is behind the group. In a series of tweets on Thursday, Trump asserted that the protesters were paid to agitate. 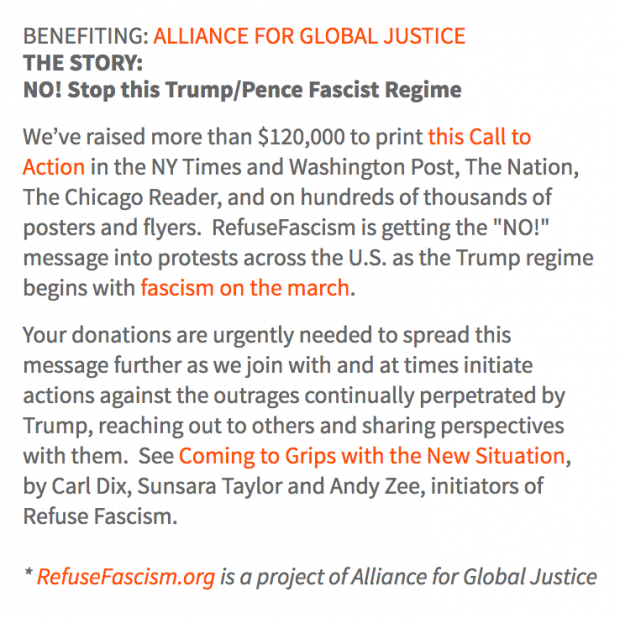 While it is unclear whether those who carried out the violence were paid to do so, the benefactors of the Alliance for Global Justice — and Refuse Fascism — are listed online. The United Steel Workers labor union also contributed $5,000. The city of Tucson is also listed in AfGJ’s 990 as a donor, but a city official says that the city acted merely as a pass-through for a Native American tribe that provided a grant to the activist group. The city official said that no city money went to AfGJ. Charities associated with several major corporations also donated. Patagonia.org, the outdoor apparel and equipment company, gave $40,000. The Ben & Jerry Foundation, the charity associated with the ice cream maker, gave $20,000. And Lush Cosmetic gave $43,950. Another bit of irony is seen in the $5,000 contribution from the Peace Development Fund, a group that claims to support organizations that fight for human rights and social justice. Another major donation came from a group that was chaired by Hillary Clinton during the 1980s. The New World Foundation gave $52,000 to AfGJ. Refuse Fascism did not respond to a request for comment for this article. Chuck Kaufman, the national co-ordinator for AfGJ, said he was only aware of the Berkeley protests through social media. “I wasn’t aware that Refuse Fascism was involved, but probably they were one of a whole lot of groups calling to shut down Milo Yiannopoulos’ hate speech,” he told The Daily Caller. Correction: This article initially stated that Fidelity Charitable and Schwab Charitable gave small donations to AfGJ. Those donations were made by individuals through donor-advised funds and did not come directly from either Fidelity or Schwab.